Wander through Open Eye Gallery’s latest exhibition Letizia Battaglia: Breaking The Code of Silence‘ and you will likely grimace at the cold-blooded murder, grieve at the devastating loss of life and shudder at Sicily’s violent, corrupt past. It is only once you transverse this emotional horizon that you might begin to wonder at the events behind the lens, in which Battaglia knelt beside the victims and immortalised them with her camera. The Guardian remarked of Battaglia’s first major UK exhibition that it ‘reminds us of the camera’s power as a weapon of factual recording and political protest.’ Indeed we accept, even encourage, these harrowing images as forms of necessary documentation and awareness. It is only when we see images like Nathan Weber’s during the Haitian earthquake of 2010 that this is thrown uncomfortably off balance. Amidst the devastation, the death of 15 year old Fabienne Cherisma by police gunshots attempting to deter looters added one more number to the gruelling death toll. Other photographers were present, Paul Hansen and Lucas Oleniuk earning acclaimed awards for their work. Yet it was Weber’s image that unleashed an international barrage of controversy and fury. In such circumstances the phrase ‘out of sight, out of mind’ appears to ring true. Despite the viewer’s implicit understanding of the images’ real-life status, any reflection on the photographer’s presence is commonly ignored if not forgotten entirely. Yet in the case of Weber’s photograph, Fabienne’s death ceases suddenly to be the sole focal point. Photojournalists are brought into a scene in which they ironically do not belong leading many towards an interpretation of exploitative opportunism. It is an image many find to be just as harrowing as, if not more than, the tragedy itself. Hensen’s image focuses entirely on Fabienne, while two looters nearby are side-lined almost insignificantly to the periphery of the frame. Oleniuk attributes more of the focus to the looters, causing the viewer to be shocked simultaneously by both the tragedy and the apparent indifference of those around her. Weber’s contribution adds an entirely unwelcome element of truth while without the photographers’ various images of Fabienne’s mourning family, the insurmountable grief and sorrow of the situation would not have been documented. Letizia Battaglia’s photographs similarly capture a more complete account of the happenings in Sicily. While some expose the magnitude of loss and devastation experienced, others reveal a morose almost defeated atmosphere, commenting perhaps on the mass scale of atrocities that has lead tragically to a certain desensitisation among its population. It is the universality of the subjects’ raw emotions, their unbridled horror and muted, hopeless despair, which draws in the viewer and elevates these images to their artistic status. The intrusion of the images’ creators shatter this illusion as we recoil from their attempts to transform tragedy into an aesthetic commodity. 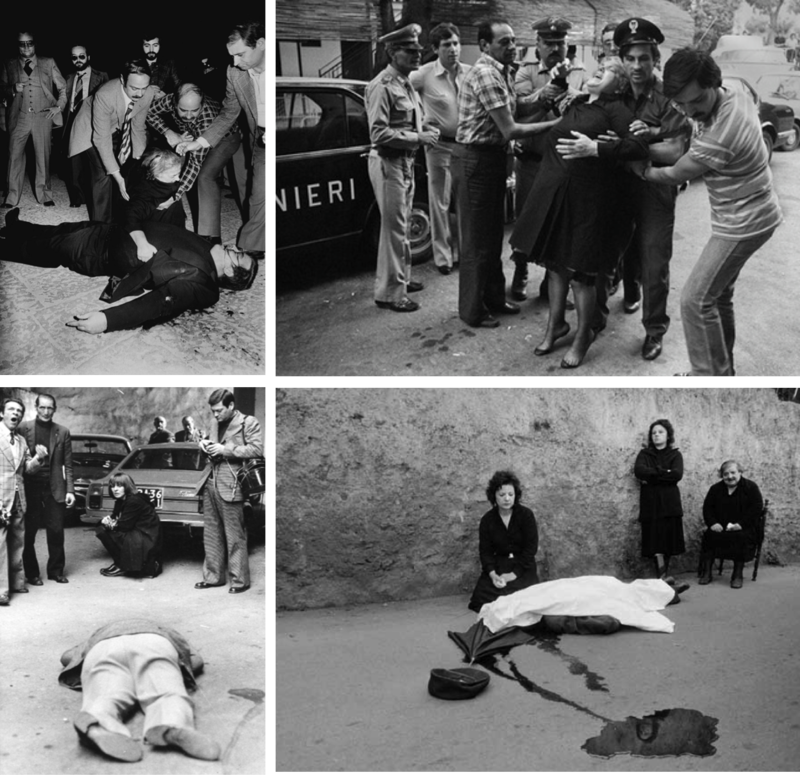 Errol Morris asks ‘why does moralising about ‘posing’ take precedence over moralising about the carnage of war?’ It is something perhaps best addressed in an image by Mexican crime photographer Enrique Metinides. The reflection of the prying crowd may understandably evoke a sense of tastefulness and disgust by the viewer, yet it may in fact mirror the intrigue of the viewer himself.